Christine DeWolf has found the right chemistry at Loyola. Christine DeWolf much prefers her current posting to her previous one in Manchester, England, where she worked with and taught engineers. “It wasn’t the institution (UMIST), or the people — they were lovely,” she said. DeWolf studies how the surface structures of cells and molecules play a role in determining what goes on in and around them. 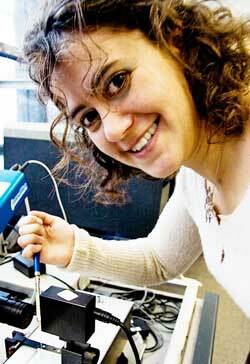 “I’m looking at the driving forces in biological systems and processes,” she explained. Much of her work involves lipids, organic (carbon-containing) molecules that are insoluble in water. They include things such as fats, ear wax, detergents and cholesterol. DeWolf has a particular focus on phospholipids, the primary component in cellular membranes. Phospholipids have two parts, a hydrophilic (“water-loving”) head made of glycerol and a phosphate group, and a hydrophobic (“water-fearing”) double tail made of fatty acids. Cell membranes consist of two layers of the molecules joined tail to tail: the heads of one layer form the inner edge of the cell membrane, while the heads of the other layer form the outer edge. This bilayer is semipermeable and about five nanometers thick. To minimize complexity, DeWolf and her team synthesize monolayers (single layers) of lipids and manipulate them to tease out their properties. One of their projects examines how a relatively minor membrane component, phosphoinositides, plays a major role in a wide range of cellular processes. Another looks at the weak interactions of hydrogen bonds and how they govern membrane structure. A third involves nanopatterning for biosensors, which combine liquid and solid phases of lipid monolayers on a surface. Working with such tiny structures requires very specialized equipment. “I have very much benefited from CFI (Canada Foundation for Innovation),” DeWolf said. Her grants have helped to purchase a number of pieces of equipment including a dynamic surface tensiometer, an imaging ellipsometer and a microdifferential scanning calorimeter. The tensiometer actually helped open up a whole new area of research in atmospheric aerosols. Atmospheric aerosols are particles that remain suspended in the atmosphere for long periods of time because of their extremely small size and light weight. Some aerosols become suspended when winds blow across open bodies of water, particularly the ocean. “These particles have organic material coating their surfaces,” explained DeWolf. “Over time they go from being hydrophobic to hydrophilic.” Once they develop an affinity for water, each tiny speck has the potential to form the seed of a raindrop. Bring enough of the droplets together, and you get cloud formation and rain. Using the tensiometer, DeWolf and her colleagues were able to show definitively that exposure to atmospheric oxidants, such as ozone, create defects in the surface of the aerosol which allow it to interact with water. For DeWolf, the results are interesting not just in their potential applications to weather, but also in the demonstration that the method is applicable to any molecule which has the ability to react with atmospheric oxidants.